What is the direction of the processing of light by the (human) retina and how does it happen? (1) pigmented layer, (2) layer of rods and cones projecting to the pigment, (3) outer nuclear layer containing the cell bodies of the rods and cones, (4) outer plexiform layer, (5) inner nuclear layer, (6) inner plexiform layer, (7) ganglionic layer, (8) layer of optic nerve fibers, and (9) inner limiting membrane. After light passes through the lens system of the eye and then through the vitreous humor, it enters the retina from the inside of the eye (see Figure 51-1); that is, it passes first through the ganglion cells and then through the plexiform and nuclear layers before it finally reaches the layer of rods and cones located all the way on the outer edge of the retina. This distance is a thickness of several hundred micrometers; visual acuity is decreased by this passage through such nonhomogeneous tissue. However, in the central foveal region of the retina, as discussed subsequently, the inside layers are pulled aside to decrease this loss of acuity. I have attached Figure 51-1 for people who would like to see it. My questions are: How does light travel to the inner parts of the retina first even when there are so many impeding layers preceding it? Why does it not stimulate the photoreceptors first? What is the pathway of the light after it travels to the the innermost retinal layer? 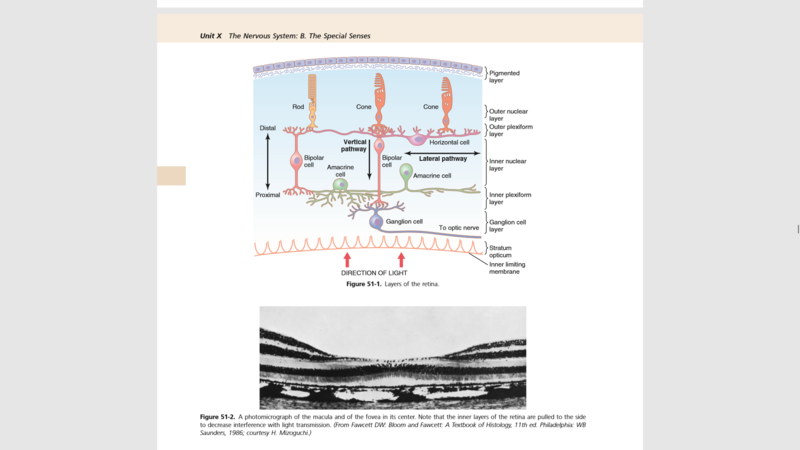 Are the photoreceptors the first to be stimulated by the light? As can be understood, I am quite confused, so if the framing of any question is reflective of erroneous understanding, kindly let me know. All help appreciated. Photoreceptors are the only cells in the retina that directly detect light; they can detect light through the other layers because those layers are so thin and effectively transparent: light passes right through to the photoreceptors. The retina is fairly thin, and the bipolar/RGC layers don't contain much pigment. Have you ever looked at a thin slice of tissue under a microscope? You can do this and focus to different layers because single layers of cells are fairly translucent (remember they contain a lot of water): most light passes right through them. Some cells, such as red blood cells or photosynthetic plant cells, are harder to see through, but that's only because they are full of pigments. The reason the photoreceptors respond to light in a way that can be detected biologically is that they contain special photosensitive pigments. In rods, this pigment is called rhodopsin and it is composed of a protein and a molecule of retinal. Most other cells in the retina don't have any such photoreceptors (there is a special class of retinal ganglion cells that is an exception, see for example here - these cells have a pigment melanopsin and contribute to light detection for circadian rhythms rather than vision). Other cells in the retina respond to light only because they are sensitive to neurotransmitters released by photoreceptor cells and other retinal cells. As far as why this is the arrangement, with photoreceptors in the back, it's really just a fluke of evolution and evidence that evolution and not design is the best explanation for diversity in biology. Eyes have evolved more than once in animals, however, and cephalopods like squid do not have their retinas arranged this way; in squid the photoreceptors are the most superficial layer. Not the answer you're looking for? Browse other questions tagged eyes sensation senses or ask your own question. What is the strength of human cornea? The arrangement of retinal cells? What is the minimum functional biological light sensor? How does kinesthetic work and with what do we sense this? Can the retina emit light? What is the smallest difference in light wavelength that the human eye can detect? What is the mass of a human retina? Insects are attracted to light, what if the light is too bright? how much can changing light enter the eye shap what you see?